The Plain Dog Dress in Purple will have your dog looking and feeling great. Solid color dress with ruffle skirt. Stand out among all the other dogs! The Plain Dog Dress is a cool, comfy design for a perfect look year-round. This sleeveless dog dress is great on its own or can be the foundation of an entire outfit. Great for personalizing or screen printing on your own. Classic and simple style for your dog! Made with a 65% cotton 35% polyester blend. This dress runs small compared to many of our other brands. Always measure your pet and allow for extra room for a heavy coat and for movement! Posted On 01/31/19 by Jan G from Salem, VA Yes, Jan G recommends this product! Lovely color, with a little tailoring my Stormy loves it! Idiopathic hair loss makes her a little bald on her back, these dresses work perfectly!!! Got this in extra small for a 4 week old puppy. I figured she would grow into it in a few weeks but to my surprise it fit her perfectly already. It's so hard to find clothes for dogs that small. I love how the sizing works on this site !!! Posted On 08/02/17 by sarah f from , MA Yes, sarah f recommends this product! Posted On 07/09/17 by Barbara from Crestwood , KY Yes, Barbara recommends this product! Adorable purple dress. Well made. Fits well. Posted On 05/15/17 by Susan L from Goodyear, AZ Yes, Susan L recommends this product! 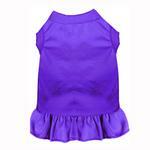 Lucy likes her sporty purple dress which is perfect for puttering around the house and playing with her doggie brother Winston and cousin Sierra. Nicely made and looks adorable on her! Posted On 03/08/17 by Dawn B from Rocklin, CA Yes, Dawn B recommends this product! These little dresses are so cute and great for summer. Maltese dogs are always cold so my little 5 lb Zoey will love these. I got two a purple and a pink one! Posted On 02/22/17 by Karen S from Cedar Springs, MI Yes, Karen S recommends this product!